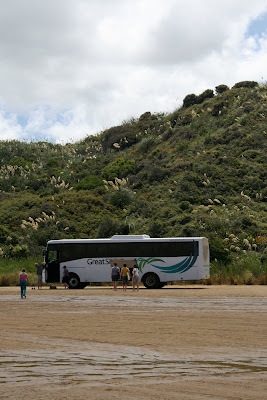 My first full day there was spent on an excursion to 90 mile beach and Cape Reinga which is the Northern most part of new Zealand. After being picked up from the hotel at 6.30, we made our way up to the 90 mile beach.... it isn't actually 90 miles, its nearer 55! There are several stories as to how it became to be thought of as ninety miles long but the main one is that it was measured by missionaries riding along it on horse back, who calculated that as it took 3 days to complete and their horses covered 30 miles each day the beach was therefore ninety miles in length. What they forgot to take into consideration, however, is that the horses were moving at a much slower pace due to the fact that they were walking on sand! So here we are setting out on our journey... the roads are actually this busy all the time!!!! The entrance to Ninety mile beach... obviously you have to be aware of tide times are there are only a couple of places to enter/leave the beach... there was plenty of evidence along the beach of people who hadn't taken heed of the tides and who had paid the price with their car!!! Lots of tin roofs jutting out from the sand and abandoned rusty vehicles! 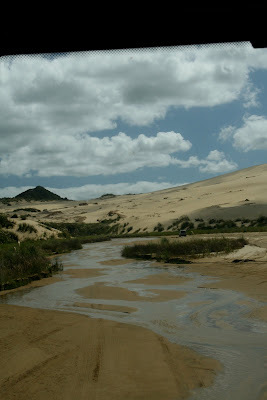 The sand is quite hard in most places which enables you to drive along the beach. Incidentally, if you plan to do this in a hire car... think twice... you will NOT be insured should anything happen to you along the way! This is a view looking back towards The Bay of Islands and the 'hole in the rock'... more about that soon..
... some of the biggest sand dunes I have ever seen .. This is where we piled out............... grabbed a surf board............... climbed the dune........... huffing and puffing....... and surfed down again..... wheeeeeeeeeeeeeeeeeeeee! 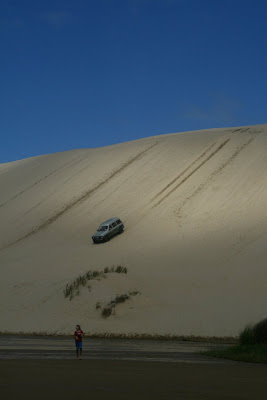 Brilliant fun, but walking up the dune was killing... one step forward..... a long slip back! Coming down on a board was not the only way to come down! Here we are at Cape Reinga... the northern most point of New Zealand and the place where the Pacific ocean and the Tasman sea meet... what's amazing about this is that you can actually see where the two oceans meet... there is a definite line in the water... honest! 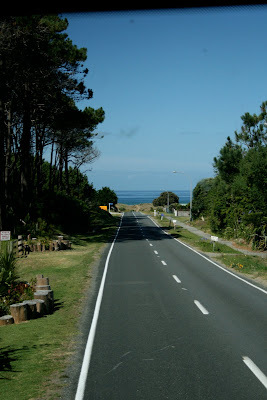 This is State highway 1... the main road that runs the length of the north Island..... good condition eh???? The last house before you reach the lighthouse is 3 hours drive from the nearest supermarket... imagine that! Remember the 'hole in the rock'... well, here it is again but from a very different angle. 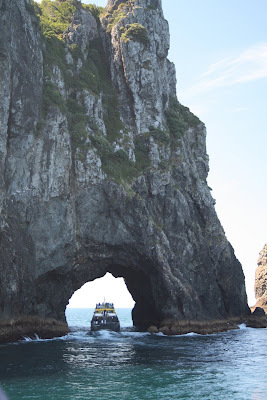 the following day we took a boat trip around the Bay of Islands which included a daring drive through 'the hole in the rock'! I am hoping to show you a few more photos of the rest of my time in New Zealand... very different scenery to the white wonderland that we have all be experiencing of late. Hope you are feeling better. I have had a pulled muscle all week, I wouldn't mind though but it didn't hurt at work only when I tried to relax in the afternoons and evenings and worse of all bedtime. Glad you are starting to feel better. I will be very interested in hearing about the changes you make with your back in mind. 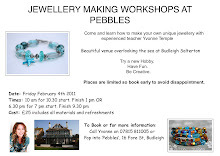 Who knows it may help me as well! Thank you for the wonderful photos. I'm looking forward to my trip end of Feb. I do hope you are feeling better, Im sorry to hear you are in pain with your bad back..but delighted you have taken time to post all those stunning photos of your trip! What an amazing beach!! I am in a state of mild envy - the picture of the islands is just gorgeous! !